MacKayla Lane was just a child when she and her sister, Alina were given up for adoption and banished from Ireland forever. Twenty years later, Alina is dead and Mac has returned to the country that expelled them to hunt her sister's murderer. But after discovering that she descends from a bloodline both gifted and cursed, Mac is plunged into a secret history: an ancient conflict between humans and immortals that have lived concealed among us for thousands of years. What follows is a shocking chain of events with devastating consequences, and now Mac struggles to cope with grief, while continuing her mission to acquire and control the Sinsar Dubh--a book of dark, forbidden magic scribed by the mythical Unseelie King that contains the power to create and destroy worlds. 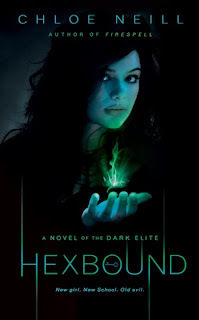 Hexbound sounds very intriguing. Two great picks there - will keep a look out for both next year! This was my WOW last week! I seriously can't wait for Shadowfever. I haven't read Chloe Neill's young adult series yet but I'll check it out.